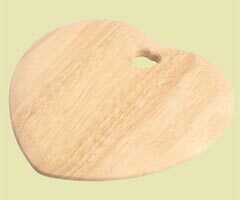 A beautiful heart shaped mezzaluna chopping board. Makes chopping easy with its superb rocking action. A really lovely and useful gift for someone special. Size: 250 x 235 x 15mm, 40 characters are included in the price and the lettering can be engraved in one of our many fonts. You can also add one of our standard images - we have hundreds to choose from!